Welcome to Fr Stephen Morrison: He is a member of the Norbertine Order (Premonstratensian Canons Regular) based in Chelmsford, where his community run 2 large parishes. He was ordained in December 2014. His jobs now include school chaplaincy, teaching & catechesis, liturgical music & various pastoral roles as curate in the parishes of Chelmsford. Before ordination his studies took him to France at Chavagnes where Ferdia McDermott & numerous members of St Bede’s community have visited & worked, (it was then he first came to know St Bede's), Oxford, London & Rome. Sung Vespers & Benediction: 5pm today. Christmas Offerings: In the porch & around the sides of the Church are the envelopes for your Christmas Offerings for our 3 priests. As you are aware, a priest does not get a salary as such, & relies on the Collections at Christmas & Easter, as a significant source of income. These 2 collections are the only ones that are for the priests of the parish. Please be generous as your means will allow. If you normally give via Standing Order through the bank, please put your Gift Aid number on the envelope. If you don’t have it, contact Marie Chang. Special Sunday - Today 11am Mass: Ordinary: Missa Ave maris stella (Victoria); Offertory: Ne timeas Maria (Victoria); Communion: Canite in tuba (Guerrero); After the Gospel: Alma Redemptoris Mater (Palestrina). Sung by Cantores Missae under the direction of Charles Finch. Music for the Tridentine Christmas Eve 'Midnight Mass': The Mass will be Mozart Missa brevis in D K194; Offertory Motet: Laudate Dominum (Mozart) and the Communion Motet will be O Magnum Mysterium (Victoria). 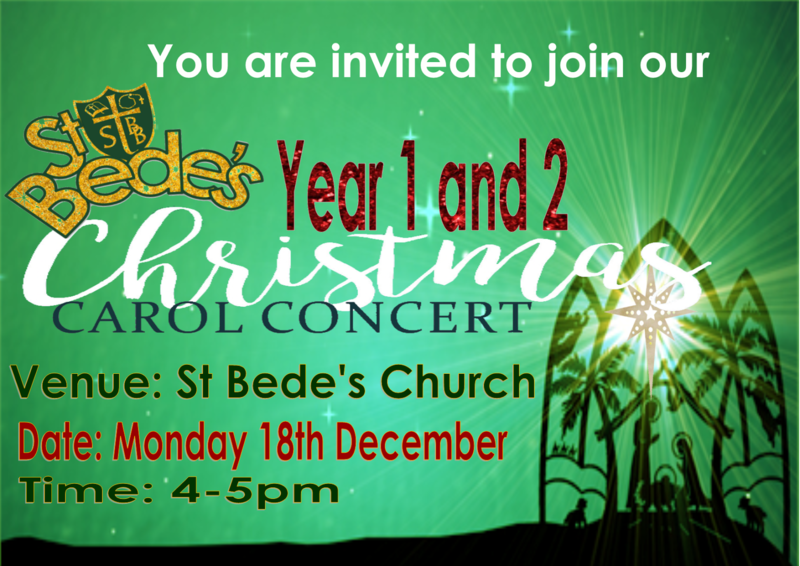 Christmas Carol Service with children of St Bede’s on Monday 18th December 4-5pm. This ends with Benediction. St Bede's Youth Club: Last meeting of 2017 is 4.30-6pm today. Open to all 10 years & older. 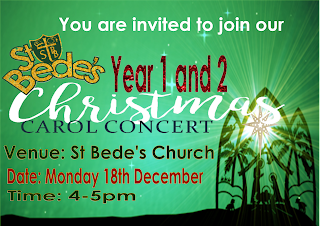 Come along, bring your friends and have some pre-Christmas fun. Youth club will return on 8th January. Fr Andrew: hopefully will be us later in the week. Confirmation Application Forms: Please see Fr Chris or Fr Przemek today to collect yours. New Readers Rota Available: Please note that this rota includes the weekend of 30th /31st December which was omitted from the last rota by mistake. Cleaners Rota: Tricia & Emma Johnson, Teresa Ablett & Franca Otuo. The rota for Jan to Jun 2018 has now been posted.